With the EA OLEDS102-6LGA display family, Electronic Assembly introduces a product that combines the advantages of OLED technology with a particularly small form factor. The module offers the typical OLED high contrast ratio of 2000:1 and an extremely fast response time of only 10 microseconds – without any afterglow. 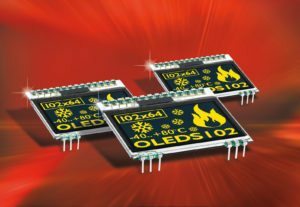 In addition, the displays of the EA OLEDS102‑6LGA series are conveniently easy to install: As the first OLED display developed by Electronic Assembly, this model can be plugged directly into a socket or soldered onto the circuit board. Fault-prone cable connections or complex soldering procedures belong to the past. The most important advantage, however, relates to the simple mechanics: Due to its construction no screws, glue or other assembly constructions are necessary. At the same time, the pins also ensure the fastening. With its low height of only 2.4 mm, the EA OLEDS102‑6LGA provides a particularly slim design for electronic handheld devices. In addition to its remarkably flat construction, the display module offers an extremely good ratio of its external dimensions to the active display area. Thus, the EA OLEDS102‑6LGA is recommended for all applications where an above-average space economy is required. A wide operating temperature range (-40 to +80°C) allows operation outdoors and in harsh environments. With a service life of 50,000 operating hours (100,000 hours are possible), the display is also suitable for applications requiring particularly long operating times. The model EA OLEDS102‑6LGA features a resolution of 102×64 pixels – this allows the display of eight lines and 17 characters or four lines with 12 characters in large format. A SSD1306B controller is integrated and enables the display to be controlled either via an SPI or I²C interface. The content is displayed in yellow on a deep black background. Visit Electronic Assembly at the embedded world 2018 in Nuremberg: Hall 1, booth 1-389. This entry was posted in Displays & LEDs, Displays & LEDs, Displays and LEDs, Europe, Global, North America, On Ticker, top articles, UK. Bookmark the permalink.